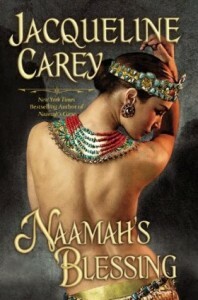 Today I am very excited to have an interview with an author whose work I admire greatly, Jacqueline Carey. 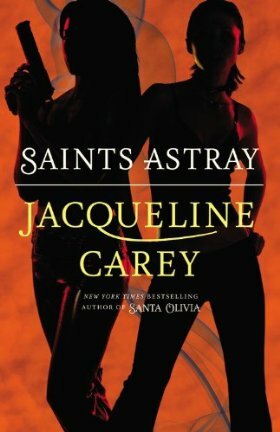 Jacqueline Carey has written the Kushiel’s Legacy series, the Naamah trilogy, the Sundering duology, and Santa Olivia and its sequel Saints Astray (available today!). She has amazing diversity as an author – all her books I’ve read are very different from each other and have very different main characters. I have really enjoyed every single one of her five books I have read so it is a great pleasure to have her here today. 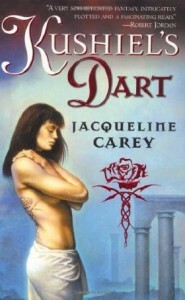 For more information on Jacqueline Carey and her books, visit her website. Fantasy Cafe: First of all, thank you for taking the time to do an interview. I love your writing and am ecstatic to have the opportunity to ask you some questions. 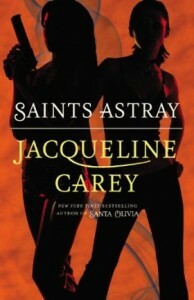 Your newest book, Saints Astray, is a sequel to Santa Olivia. You describe Saints Astray as being more light-hearted than the first book. Can you tell us a little about how it’s different from its predecessor and what fans of Santa Olivia have to look forward to? Is this the end of the story or do you think you’ll be writing more books in this setting? Jacqueline Carey: All the action in Santa Olivia takes place in one isolated setting, an occupied town in my fictional border zone. In Saints Astray, the whole wide world is opened up to my (literally) fearless heroine Loup and her sidekick Pilar, and they experience it with wonder and delight. Because they’ve led such restrictive lives, everything is a first. Hotels, room service, phones, the ocean, airplanes, movie theaters, pain au chocolat… it’s all new. There’s an inherent joyfulness in this exploration. But of course, there’s always a shadow of sorrow and regret hanging over them, and ultimately, Loup will risk everything for the sake of those they left behind. At this point, I don’t plan to write further books in this setting… but they are an awful lot of fun. As always, never say never! FC: I was very excited to hear you are working on an urban fantasy trilogy about a “reluctant hell-spawn heroine” and am looking forward to seeing what you do with it. I also wasn’t at all surprised to see you said it was very different from anything you’d written before since I’ve thought that about every new book/series of yours I’ve read. Can you tell us a little about the series, how it’s different from your other books, and what drew you to writing in the urban fantasy genre? What do you foresee as being the biggest challenge about writing this series? JC: It’s a contemporary, which is different! Daisy Johanssen, my reluctant hell-spawn heroine, serves as the liaison between the mundane and eldritch authorities in a small Midwestern resort town that does a booming business in paranormal tourism. When a young man drowns under suspicious circumstances, it falls to Daisy to investigate amidst rising tension.The series is a blend of whimsy, wonder and creepiness. For me, one of the great appeals of urban fantasy is that rather than transporting the reader to another world, another time and place, it gives the reader a prism through which to view this world, here and now, and imbue it with magic. That’s a marvelous gift. The biggest challenge lies in the fact that this is a very crowded subgenre, and it’s not easy to put a fresh, unique spin on it. But I’ll do my best! FC: On your FAQ page, you say you “have been inspired by landscapes, by vivid dreams, by other books, by movies, by art history lectures, by passing comments, by a fleeting emotion, by misremembering an entry in a dictionary.” What are some of the specific details of some of these inspirations and how they’ve been used in your stories? I’m particularly curious about the story behind misremembering an entry in a dictionary and how that influenced your writing. JC: I thought I’d seen the name “Elua” in A Dictionary of Angels, but it was actually “Eloa,” the name of a female angel born of of a tear shed by Jesus in a poem written in 1823. That was the genesis of my deity Elua, born of the mingled blood of Jesus and the tears of Mary Magdalene. A trip to the south of France – the quality of the sunlight, the scent of lavender – inspired the setting of Terre d’Ange. Also, the book Holy Blood, Holy Grail (which also served as the basis for much of Dan Brown’s The DaVinci Code). While I was still working a day job at a local college, an art history candidate’s lecture on Greek temples sparked an idea for the climactic scene in the Temple of Asherat in Kushiel’s Chosen. Those are a few! FC: Religion plays a large role in your novels – the story of Elua and his companions that lead to the way of life based on “love as thou wilt,” Moirin’s devotion to where her goddess leads her, and the people of Santa Olivia who feel abandoned by God. What is it about religious themes that inspires you to include them in your work? JC: Honestly, I couldn’t say. They’re big themes, and I enjoy exploring them. It may have arisen in part from a feeling that while religion frequently plays a role in fantasy, it’s often just another plot device. Gods and goddesses may be super-powerful beings using mortals as playing pieces in a complex game, but there’s seldom a sense of actual living faith involved. Which is ironic, since in our everyday reality wherein the existence of the divine can’t be proved by any measurable means, faith exerts considerable sway over human existence. FC: I’m really impressed by your diversity as an author and your ability to write books with very different writing styles that are suited to the main character. Phedre is a much more complicated character than Moirin and they each have a very unique but beautiful narrative voice reflecting their personalities. Likewise, Santa Olivia has a more modern, casual tone that fits Loup and the setting that shaped her very well. Do you find it difficult to keep the narration for each of your characters unique? Or do your characters, their personalities, and experiences dictate the writing and tone? JC: It’s more the latter, although in Santa Olivia and Saints Astray it was a deliberate choice to write with a more simple, muscular lyricism. After the more ornate voices of the Kushiel series, I needed a palate-cleanser! My biggest challenge was probably writing a male protagonist from a 1st-person POV in Imriel’s trilogy – and most especially in Kushiel’s Mercy, which contains a serious feat of narrative gymnastics. FC: You write very strong female characters, and I especially love how they all have different strengths and personalities – you never write the same character twice. Loup is a kickass character, Phedre is immersed in politics as a spy and courtesan, and Moirin has lots of compassion, devotion, and charisma. What do you think makes a well-written female character and what qualities do you think are important to giving her depth? Who are some female characters you think are particularly well-written? JC: You know, the more I think about this, the harder it is to answer. A lot of character-building takes place on an intuitive level for me. But I don’t think there’s a single set of criteria or specific qualities. Phedre’s a very complex and sophisticated character, while at the other end of the spectrum, Loup’s fairly simple and direct; it’s the effect she has on other characters that’s more complicated. 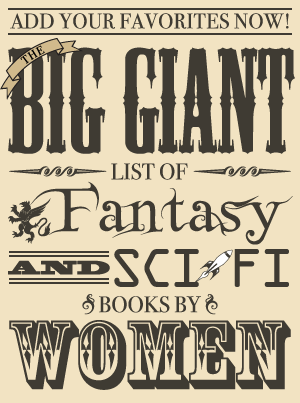 There are a tremendous number of ways for a character, female or otherwise, to be well-written. It’s probably easier to discuss the ways in which they aren’t. FC: Releasing your very first book about a courtesan who finds pleasure in pain seems like a really big risk for a new author to take. Did you ever worry that this would scare people away from reading your books, and if so, why did you decide to write about it anyway? Were you ever tempted to write about something tamer and get established as an author before releasing Kushiel’s Dart? JC: Oh, I was terrified! But from the first inkling of conception, that was Phedre’s nature. Sometimes the Muse says, “It is what it is. Take it or leave it.” I thought long and hard before I decided to take the plunge. Ultimately, I chose to write Kushiel’s Dart because I felt it would be fascinating to take the subtext of eroticized violence that pervades popular culture and turn it inside-out, put it in the foreground; to adopt and subvert the trope of the heroine-as-victim. I actually did write a few “practice novels” that were a lot tamer, but none of them sold. It wasn’t until I took a major creative risk that I found success. FC: If you had the chance to send a message as Santa Olivia, what would your message be?